Marquette Catholic congratulates Payton Bradley, Natalie Brown, Frankey Grabowski, Kennedi Koetzle, Daniel McCluskey, Riley Siener, Sophia Suchomski, Garrett Weiner, Maria Wendle and Grace Yost on being the 2019 MCHS Silver Medallion Award recipients. 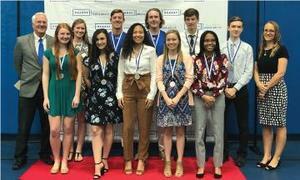 “Hard work” was a catchphrase used by students, teachers and parents to describe what it took to get to the Riverbend Arena for the 31st annual Silver Medallion Academic Excellence Awards Banquet, held Thursday, March 21st at Lewis and Clark College. Over 800 parents, administrators, teachers and students gathered at LCCC to recognize the top 8% of area public and private schools. Participating schools included Alton, Brussels, Bunker Hill, Calhoun, Carlinville, Carrollton, Civic Memorial, Connect Christian School, East Alton-Wood River, Edwardsville, Father McGivney Catholic High School, Gillespie, Greenfield, Jersey Community, Marquette Catholic, Metro-East Lutheran, Mississippi Valley Christian, Mount Olive, North Greene, Roxana, Southwestern and Staunton high schools.